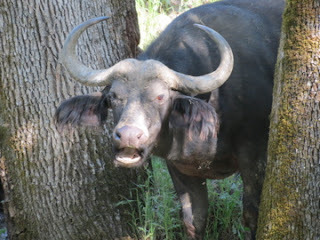 At the beginning of our jeep tour, our guide told us that if anything was dropped from the jeep, she'd try to retrieve it, UNLESS it was near the cape buffalo. So we're parked in the buffalo enclosure, with a few head grazing to our right, including this cow, and a bunch more in the lean-to at our left. I'm riding shotgun next to the guide, which means I'm staring this one in the face. She's down the slope in a great position for me to get a good photo. However when she starts up the hill with her eye on the jeep, my photo op makes me a bit nervous. In fact the shots after this one are too blurry to share as I wanted to keep my eye on her and get the attention of the guide who was pointing out this cow's baby on the other side of the road! There was an "object overboard" later in our trip, but thankfully it wasn't near any dangerous animals! Still, I love getting this close to wildlife, and the guide was an animal encyclopedia as well as being always aware of our safety.